My sister picked it up from a farmer she knows. Here we actually grow trees to be used at Christmas time. Firs are very common here also in the nature. My sister's son has a girl friend who attended Rudolf Steiner school (also known as Waldorf education) like my children and she had made a woollen image of Piitu. It is created with a special kind of felt making using needles. It is not a very known skill nowadays. I have eaten tons of chocolate and played games with the children. Katri got a game named Toledo for Christmas and I got a Rummikub game from Israel last summer and we have not played it so far. Now we just have to settle an argument about the rules before we can play it again. This time of year is important but hard to come up with a suitable wish to all the people over the world. I think before "Seasons Greetings" were very common; now "Happy Holidays" seems to be the correct expression. Yule or Yule-tide is a winter festival that was initially celebrated by the historical Germanic peoples as a pagan religious festival, though it was later absorbed into, and equated with, the Christian festival of Christmas.The term "Yule" is still used in the Nordic Countries to refer to Christmas. In modern times, Yule is observed as a cultural festival. Originally the name Giuli signified a 60 day tide beginning at the lunar midwinter of the late Scandinavian Norse and Germanic tribes. The arrival of Juletid thus came to refer to the midwinter celebrations. By the late Viking Age, the Yule celebrations came to specify a great solstitial Midwinter festival that amalgamated the traditions of various midwinter celebrations across Europe, like the solstice celebration. A documented example of this is in 960, when King Håkon of Norway signed into law that Jul was to be celebrated on the night leading into December 25, to align it with the Christian celebrations. RennyBA has an excellent explanation about this in his blog from the Norwegian point of view. "Are there (any) good (well-behaved) children here?". Presents are given and opened immediately. He usually wears red, warm clothes and often carries a wooden walking stick. 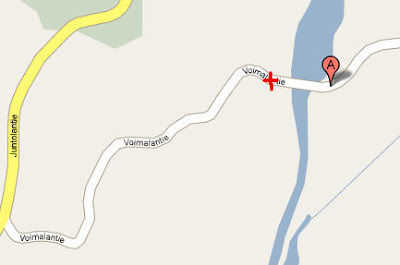 His workshop is in Korvatunturi, Lapland, Finland, rather than at the North Pole like Santa Claus, or in Greenland. He is married to Joulumuori (tr. Mother Yule). Typical Finnish yule dishes include ham, various root vegetable casseroles, beetroot salad, gingerbread and star-shaped plum-filled pastries. Other traditions with a non-Christian yule background include joulukuusi ("Yule spruce") and joulusauna ("yule sauna"). It is early in the morning and others are asleep. I will soon start to make our traditional Rice Porrige, which takes about an hour to get ready. I wish merry Yule to everyone! I did not even know mice could be this smart. A long track and he does it on his own! The colour of the line is always the colour of the starting point. The most popular Christmas tradition wears a new shape this year as Conceptis uncovers a 15-grid Multi Sudoku puzzle with the outline of a Christmas tree. Unfortunately the poster is not available in Finland but at least I can play the puzzle in Conceptis website. Maybe I should try to e-mail to the publisher in Denmark. They have sent me a couple of Tazuki magazines before. Nowadays My Conceptis page looks like this. I solved some sudokus also, but I did not solve the first one and that is why it is empty. 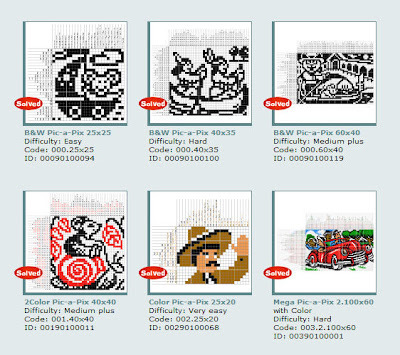 I also took a snapshot of the Link-A-Pixes. The pictures are so beautiful! One was left unsolved. New puzzles were published today. Now I have a new set and also the weekly review puzzle is a PAP. I think I am able to finish that one tomorrow to be able to review it. My daughter and I have had a project which has been going on for at least a month. First of all I love candles. Whenever I see exceptional or beautiful candles I just have to buy them. I never throw the remains away but store them and my daughter has been doing the same. I have not made new candles in several years so we had lots of material collected. Some candles don't burn very well and most of the stearin is left unburned. I have an old small kettle which I got from my mother and I have used it for melting the stearin for years. Earlier I did not use the right way but I put the kettle straight to the stove. It is actually dangerous if you are not standing right near the kettle with a lid ready. If the stearin gets too hot it can burst into flames. Now I had to figure out something new. I had bought an induction stove a couple of years ago. Since the wikipedia article shows a totally different picture, you can check the Finnish Helkama here. This type of cooktop does not work with kettles that are constructed from non-conductive materials. Unlike normal electric hotplates an induction cooker creates no heat; only the vessel used for cooking is heated. The basis of heat generation is magnetic field hysteresis loss. So my old kettle did not work any more. Now I used a water bath like I always should have and the vessel next to the stove was made of steel. Like you can see the stove is not heated; I have a towel protecting the stove. As moulds we used practically everything: Pringles wrappings, energy drink bottles, plastic jam jars and glass bowls which have had candles in them originally. When the liquid stearin hardens again it loses volume and that is why the candles must be done gradually but that makes the task rewarding. You can see the result when you remove the container. I was totally fed up with the work after one day but my daughter wanted to finish all the materials. These are the ones where the containers were removed by cutting them with a sharp knife. Some people don't want to burn candles but I think candles make the dark winter so much warmer. The Finnish candles are the best. They don't start running, but the extra edges are folded beautifully beside the candle. Last Sunday I was very tired and I felt a little feverish. Piitu was going to attend to her first official agility competition. She had taken part of some competitions "for dummies" but she was dismissed every time because of too many errors. All the obstacles have to be done in a certain order and Piitu usually does not care. I decided to leave home. This time the coach was Piitu's teacher Noora Salonen who is very experienced in dogs and teaching. Here is a video of the first competition. No mistakes but 3 seconds over the time limit and third place in the competition. When my daughter phoned us about the success, we decided to go and see this miracle. Maybe because we were there the second track did go wrong from the second obstacle... Result: dismissed. We went back home and Piitu was left for the third competition and this time no errors, not exceeding the time limit and second place. The first step in a hopefully long career. With three similar results Piitu gets to a more advanced level. Here is the winner with her trophies. It is amazing how much lighter and cleaner the world looks like. The snow is still there after two days and did not melt right away like usual. It seems that I did not take the picture straight but in fact the trees are leaning to the east. The wind normally blows from the sea and the trees are unable to grow straight. My daughter graduated in May from the University and I had already bought her a book as a gift but somehow it did not seem valuable enough for such an accomplishment. We had very good experiences about navigators on our visit in Israel and we also had several problems travelling to unfamiliar places to dog shows. So I decided that we would buy her a GPS navigator and our choice was Tom Tom which is probably the most popular here even though we had Mio in Israel. The following story is really embarrassing for both me and my daughter but I decided to tell it anyway. About three weeks ago we were once again leaving for a dog show in Hämeenlinna, about 140 km from here. We have been there often and if we had been wise, we would have used the navigator near the destination. However since the gadget was new, we started to use it from home. The road started fine but the longer we drove, the more bumpy the road got. There were rocks on the road and it was so narrow that only one car could drive it at a time. It had been raining a lot in the past days and there was wet clay on the road. By the time we realized we should not have taken that road, we could not really turn back anywhere. The last thing was a steep downhill towards the river. The middle part of the road was so high that we got totally stuck. At that point the whole road was just clay, no solid part anywhere. Piitu did not make it to the dog show that day. She was not disappointed. She just loved to run around the field near by. The next thing was to call a tow truck to get us out of there. The most curious thing was that the truck driver did not find us. He said that according to his navigator there is no road there! My daughter walked to the intersection and the truck backed up to us... well almost to us because his truck could not take the last 200 meters. The truck driver contacted the farmer whose fields were surrounding the road and he came to take a look. He was a bit pissed off but promised to pull us up with his tractor. I can understand his annoyance; he told that we were the third ones he had to save that week (!) because the navigator had told to use that road even though he had several times informed the municipality that the road must get a sign informing that it can't be used. It really was a field road for tractor traffic! Here is the tractor which saved us. It has the huge plough equipment on the back. Here is the picture from the Google Maps and it shows the road also. We were stuck at the spot where the red cross is. I heard later that if we had managed to cross the river we probably would not have made it to the Google pointer anyway...the direction we should have followed is the yellow one. Both of us blamed ourselves for what happened. Well, there is a saying that what doesn't kill you, makes you stronger. The wheels and the bottom of the car have now been washed and the toe has been adjusted. Now that I finally decided to take the time to update my blog, I noticed that I have not written in a month! This autumn has really gone fast. I have some reasons for missed weekends which I will blog about and my work seems to take so much time. Of course the puzzles take a big part of my time but sometimes I have felt I have not enough time for them either. Piitu really has only two modes, on and off. When she finally gets tired, she totally drops from standing feet. She can really find the most comfortable places to relax. The last one is a video. Piitu learned to jump into a cardboard box a long time ago. We did not have the box available for a while and when we tried again, she had not forgotten the command, but she really had learned to jump. The jumps were really high regarding the size of the box. We had a good laugh watching. I think I am much more selective than before, but once again I found a game which got me playing all over again.This is the first screen which shows a hint where the cursor should be. The pixels are in 3 dimensions and you have to rotate the image so that you are looking at the picture from above and seeing the projection of the pixels in a plane. It is not very easy at first but the progress makes you scontinue with a new game. One of the good features is that the images are not the same from game to game. 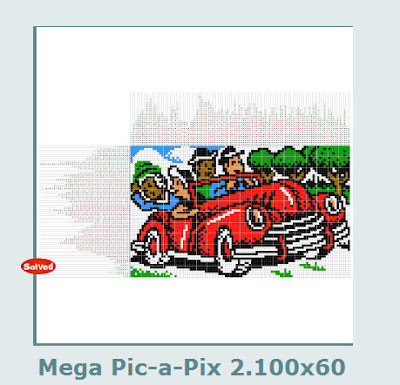 It is unbelievable how big the effect on the pixels is when you move the cursor just a little bit. I found the game in Random Good Stuff and you can play the game here. Martti Ahtisaari was the President of Finland in 1994-2000.
central to the solution of the complicated Aceh question in Indonesia. In 1999 and again in 2005-07, he sought under especially difficult circumstances to find a solution to the conflict in Kosovo. Artturi Ilmari Virtanen 1945 in Chemistry for his research and inventions in agricultural and nutrition chemistry, especially for his fodder preservation method. so that the objects fall from the first drawer to the second. I must admit that if I placed something in safekeeping here, I probably never could get it out myself. The presentation is a bit long, but worth to watch. I found this cool video from kottke.org. It is a clip from Philip Morrison's 1987 PBS program "The Ring of Truth: Atoms" featuring chef Kin Jing Mark making noodles to demonstrate the principle of halving. Probably all people regardless of their math skills can use it, but I really would love to have this in my classroom. 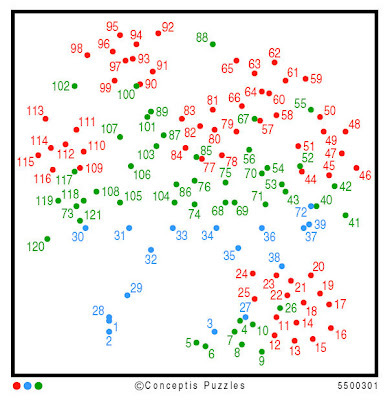 One reason for my slow blog activity has been the new online puzzles on Conceptis website. I have solved both on paper before and loved them but online playing is even more addictive. This is a game I have played as a child with my sister and also taught it to my children. The purpose of playing was to sink the opponent’s ships before my own ships were sunk. This game is played alone and the task is to find the ships with given clues. Each Battleship puzzle represents an ocean with a hidden fleet of ships, which may be oriented horizontally or vertically within the grid such that no ship touches another, not even diagonally. 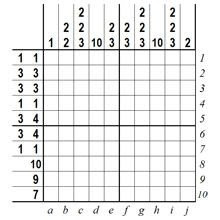 The numbers on the right and on the bottom of the grid show how many squares in the corresponding row and column are occupied by ship segments. Here is a tutorial showing some tactics. 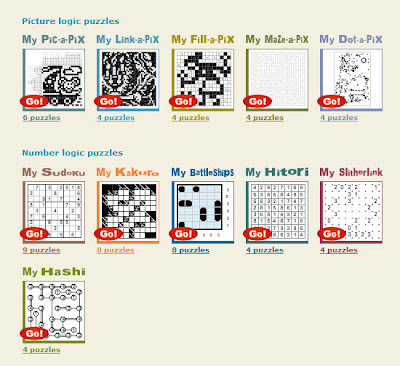 The online game is much faster and you can just click on the squares or on the numbers. If you want to try the puzzles, you can start here. Hashi is also sometimes called bridges. 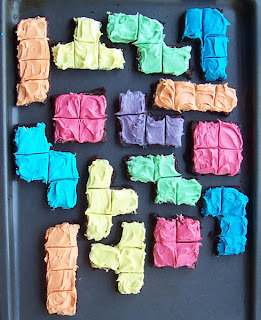 They remind me of planar graphs in graph theory even though solving them does not actually involve mathematics. The object is to connect all islands according to the number of bridges so that there are no more than two bridges in the same direction and there is a continuous path connecting all islands together. Bridges can only be vertical or horizontal and are not allowed to cross islands or other bridges. And here you can start playing. It’s odd how fast time passes sometimes. I have also noticed that the longer the vacation is, the longer you are worried it is going to end soon. The second week in August I started the worrying and thinking about all of the things I had thought of doing during the holidays. Luckily I got over that but many of the things I had planned are still undone. School started a week ago. The first days are always exciting and I am worried how many students I will have. This year the long mathematics had the greatest success in years. I even had not enough seats in my classroom and had to borrow some from another classroom. That is a really good thing. In autumn, people are starting the studies and make good decisions but later on part of them always drop off, because of work issues, family, … the reasons are numerous. I had some setbacks also. The most annoying thing is the wireless network. The school computers in the teachers’ lounge were connected to the municipality network and are now protected with passwords. Whatever anyone wants to do, he/she has to log in and remember to log out afterwards. I can’t attach my laptop to the school network but we have a wireless network also. Something has obviously changed at the same time the other network was set up because I am not able to connect anymore. My settings are the same and I tried also with my new cellular, Nokia E90, I bought this summer. Both the laptop and the cellular found the network but did not connect to the log in page. Now I’ll just have to wait until someone comes and fixes it. Luckily I have a normal computer in my classroom and I can use my USB flash drive if needed. This week I was really tired and all my time was spent in preparing the classes, the normal things I do on the computer and sleeping! I was so tired that I slept more than in ages. Maybe the bad weather has also something to do with my mood. 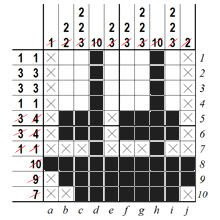 I have very often written about my favourite Japanese puzzles, Pic-A-Pix –puzzles, like Conceptispuzzles has named them. 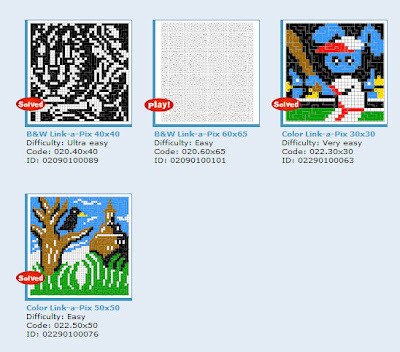 Other names for these puzzles are also used. However I have never adviced how to solve them. A new techniques article was published in Conceptispuzzles website last week. 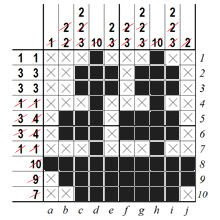 The problem with these puzzles is that the solving methods can vary very much and people can use their own logic in solving. I decided to show my technique with the same puzzle which is used in the article. I also want to point out that solving can always be done by logic. No quessing is needed and usually ends up in a mess! 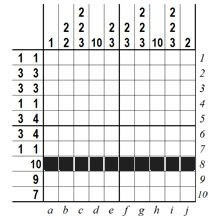 The empty grid consists of rows and columns. Both have numbers which show how many black squares have to be painted on the respective row/column. The row 5 has clues 3 4 which means that on that row you will have to paint 3 consecutive squares and 4 consecutive squares but these two blocks are separate. Well, that should be easy. 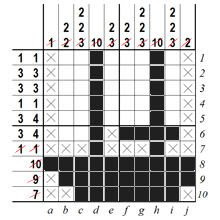 The problem here is that the painted squares have to fit both the row clues and the column clues. A valid puzzle has only one solution matching those clues and that is why it is important to think which ones have to be painted and which remain empty. The result of the painted squares is a picture. Sometimes you can even tell that something is going wrong when it looks like a person’s eye seems to be shifted near his ear. Sometimes you can’t conclude what the picture will be until you have solved it all. Usually I check first the edges. This puzzle definitely has better places to start, but these instances are generally very rare. If none of the edges can be used, I try to find the best row or column as near the edge as possible. Keeping close to the edge is safer and easier for the starting solvers. I still use it as much as I can in big puzzles. It makes me able to check the row/column clues more often. In the future I use the word clue when I am referring to the given number on the top or on the right. The painted squares and painted blocks are the visual representations of these clues in the puzzle. In this puzzle three of the edges are impossible to start with. 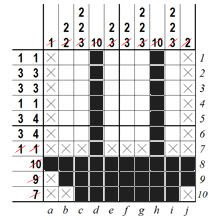 There is no way to tell where 1; 2; or 1,1 should be put in the grid. The bottom edge has clue 7 and I could use that, but the clue 10 two rows up is even better. It fills the whole row. Now I will check what that means regarding the columns. Column a has only clue 1 and I have painted one. I’ll mark all the others done. 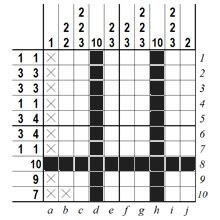 Column b has clue 2 at the bottom. I can’t place it starting from the bottom. If I would, I had a block of 3! That means the bottom square to be empty. Any other conclusions I cannot make at this point. Column c has clue 3 at the bottom and I can’t conclude anything (actually I could but that is more advanced). Column d has clue 10 and so does h. I can fill them all. In between the columns all have clues 3 and I will leave them like in column c.
Column i has again clue 3 and is left alone. Column j is interesting. I can make the same conclusion as in b. The block 2 does not reach the bottom. I can also make the conclusion that it can reach only one square upwards. I can delete all the other squares. This is the advantage of rows/columns with only one clue. When you find it, you can exclude squares. Now that I have checked all the columns, I will go back to rows and start from the bottom. Row 10 has only left 7 squares so I can paint them all and row 9 has left the nine squares and can also be painted. Now I could go on with the rows, but now the edge is ready. I will go back to the columns and I can see that all the bottom clues are painted. I’ll mark the squares above them because there has to be empty before the other blocks can continue. I could have done this before but this is the point where I finally have to do it. I mark all the clues I have used and checked. Back to row 6. Since the right side is nearer the edge I’ll start there. To the right I need a block of 4 and the second square is black. At this point I can’t be sure of the first one, but the third and fourth have to be black. Ahaa! I can’t paint the fifth because it would be attached to the next one and I would have a block of 5. So the first square was also black and I can mark the fifth square empty. Now the row has left 3 squares which have to be black. Row 5 is exactly the same as row 6 was. Row 4 has two one’s and they are there. I can mark all the others empty. But wait, I have more blocks finished in the columns and now I can check if they match the clues. Everything is OK, I can mark the 2’s as finished and at the same time I notice that columns b and f are ready. Now rows 3 and 2 can be painted. There is only one way to get the 3-blocks fit. Row 1 is already finished! Now the last thing is to check that the column clues agree on the blocks. Everything is fine and the picture is finished. 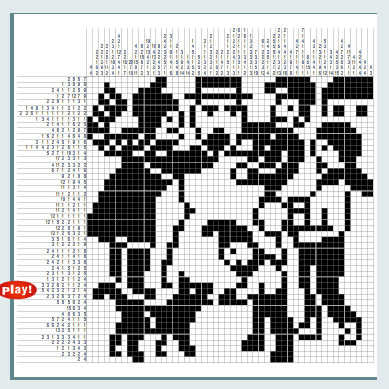 Sometimes in small puzzles you have a hard time trying to figure out what the picture is supposed to be. In these cases you should look at the picture from very far (or resize it on your computer). This was easy to see from the big picture but the tiny one is definitely clearer.